Visit Pontiac for more information on the Pontiac Vibe. The Pontiac Vibe gets a makeover for 2009 - with increased performances, tighter handling and a new bolder, athletic stance it's sure to be a crowd pleaser. 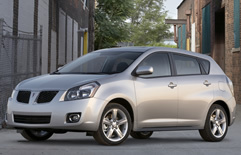 There are three models to choose from - the 2009 Pontiac Vibe base model, the Vibe AWD and the Vibe GT. The interior of the 2009 Pontiac Vibe has also been redone - receiving a sporty more performance-orientated look and feel. An AM/FM radio with CD and XM satellite Radio come standard on all models. Standard on the GT model and available on other models is a premium Monsoon 320 watt, seven speaker audio system including sub-woofer and MP3 capability. The spacious interior offers plenty of storage room including an oversized glove box, dual-tier center console, overhead console and other integrated storage locations. All models come with a rear cargo management system which uses a multitude of hooks and net-divided compartments to create numerous custom cargo storage combinations. Each of the 2009 Pontiac Vibe models have unique features to give them their own style. The AWD comes with a roof rack giving it a more outdoorsy look to it while the GT has rocker moldings, roof spoiler, larger fog lights, a chrome exhaust tip and lower-fascia air intake which give it a more sporty feel. There are three transmissions and two engines available for the 2009 Pontiac Vibe. Standard on the base model is a 1.8L 132hp I4 engine that has great fuel efficiency at 26 mpg city driving and 32 mpg on the highways. Standard on the AWD and the GT models and available on the base is a 158 hp 2.4L I4 engine. The base models come standard with a 5-speed manual transmission, standard on the AWD and optional on the base model is a 4-speed automatic transmission while the GT comes standard with a 5-speed manual with a 5-speed automatic transmission available. Safety features include - StabiliTrak electronic vehicle stability system, Dual-stage frontal air bags with a passenger sensing system, Side thorax air bags for the front passengers, Head curtain side air bags, OnStar, Tire pressure monitoring system and active head restraints.